I'm really trying to get back into exercise, but the thought of going to the gym and riding the elliptical machine for 30 minutes and then going through a round of strength training just doesn't appeal to me at all. I've been reading a lot of Paleo blogs and many of these also talk a lot about CrossFit and as much as I like the CrossFit model, I simply cannot afford to join a CrossFit gym right now. The other day I saw on PaleOMG that a new WOD (workout of the day) Genius app had been launched which would generate workouts based on what workout gear you have access too, such as a bike, dumbells, a bench, a step, running, etc. So even with minimal access to workout gear, you can get in a good workout. Yesterday I entered that I had access to running, a bike, a stair/step and the above workout was generated for me. I mapped out 1 mile around my neighborhood on gmaps pedometer and set off to do my workout. 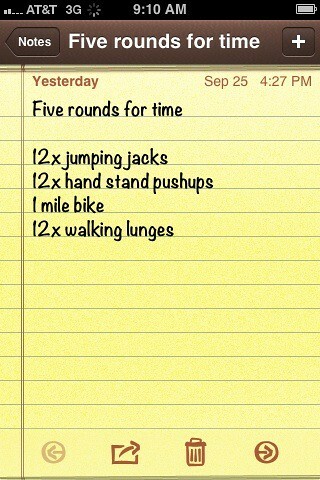 I loved being able to do this workout at home at my own pace. It wasn't super hard, but I still felt like I had a good workout when I finished and I had biked 5 miles, and done 60 of each, jumping jacks, push ups (NOT hand stand pushups, are you kidding me?? ), and walking lunges. Most importantly, I just want to enjoy the fall and get in as many fall activities as possible. And we have Bill's 30th birthday coming up so we have some fun things planned for that. And if some gf pumpkin poppers make their way into my oven, I won't be too upset about that either! Jonny and I do fish a lot in the winter (when he is actauly home for dinner). I buy the captains cut cod and bake it a with a little bit of butter and bread crumbs on top...Yum. Plus if I cut it up and mix it with white rice for Maggie she eats it too!